So you use your iPhone’s camera a whole lot – what are you going to do with the digital library of images that you have amassed over time? Surely you aren’t going to just let it be stashed away in some hard drive somewhere, do you? How about printing those photos out for physical reminder of those memories? 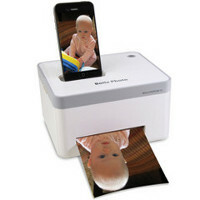 Instead of going through the tried-and-tested method of transferring photos to a computer and using a printer to churn out some copies, here is the self-explanatory iPhone Photo Printer. This $159.95 purchase is the first of its kind that delivers photo quality pictures straight from a docked iPhone or iPod touch, without the need for special software or computer. Of course, the downside is you can’t edit those photos, but then again the iPhone takes pretty decent images in the first place. Heck, there aren’t even ink cartridges to worry about, since it prints crystal-clear 300 dpi resolution pictures with vibrant colors thanks to a patented paper that has been embedded with yellow, magenta, and cyan dye crystals. These photos printed out are smudge- and tear-proof, fade- and water-resistant, so that ought to deliver some peace of mind to you. It will also play nice with Android phones (now isn’t that surprising? ), the iPad and its successor. Each purchase is accompanied by one paper pack that delivers up to a dozen prints. nice! been using print n share app on my iphone but may also look into one of these!